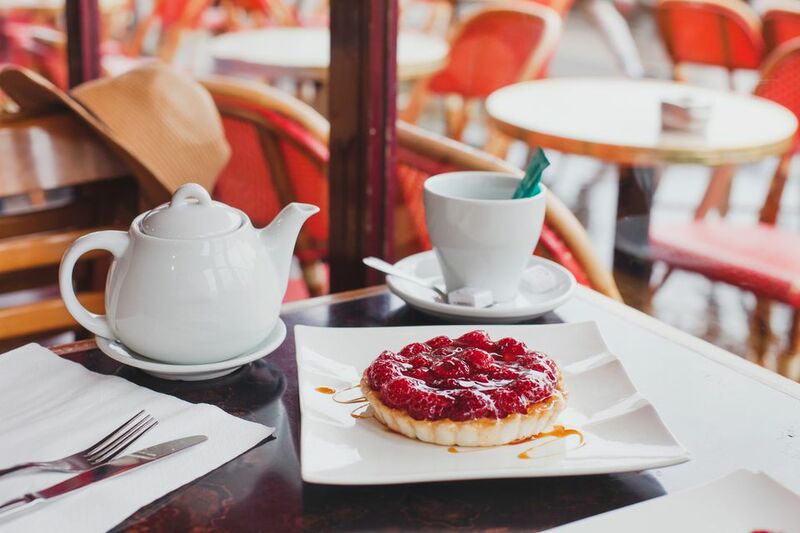 Paris might be most readily associated with espressos or cafe cremes, but a vibrant tea culture has been gaining ground in recent years. Classy, quirky, and traditional tea houses have sprung up across the city and tea has become a more popular option for the sacred French afternoon pause cafe. Even though many people in France continue to associate tea with the British, it turns out that there are real French tea traditions to be enjoyed as well. Check out these lovely purveyors of tea for a morning wake-up, a traditional afternoon tea, or a relaxing after-dinner beverage. The Mariage Frères tea house does more than just serve tea, it is a true experience for the closet tea connoisseur in all of us. The history of this French tea purveyor has its roots in the colonial 17th century when family members traveled to Persia, Madagascar and the East Indies on behalf of the company. Centuries later, Mariage Frères is still sourcing teas from around the world to create its original blends. They offer 600 different varieties from 30 countries, including the brand's own tea creations, all packaged in the iconic glossy black jars with mustard-yellow lettering. For a bit of over-the-top luxury, try their signature gold-leaf tea. Stop in for a tea-tasting at one of its tea houses, or purchase a tin or two to take home. One of their loveliest locations is in the Marais district on the right bank, at 30 Rue du Bourg Tibourg (Metro St Paul). It's a great place to stop after touring the area, or after shopping in the area's many boutiques. Another spot that's immensely popular with tourists, Angelina’s tea house, designed in a style reminiscent of the glamorous Viennese style, dates back to 1903 and epitomizes Belle-Epoque European sophistication and gourmet culture. As you sip your Mont-Blanc, a mixture of black tea with hints of caramel toffee, fleur d’oranger, candied apricot and glazed chestnuts, admire the colorful floor-to-ceiling frescos. Another favorite is the Angelina mix, which blends Oolong tea, exotic fruit, pineapple, and safflower petals. Try one of these teas with Angelina’s exquisite patisseries, like their signature Le Mont-Blanc, featuring meringue, whipped cream, and strings of chestnut cream. It's also a favorite spot for gourmet hot chocolate—the gooey and sweet kind kids and chocoholics go for. For something a little different, head to Paris’s largest mosque and its accompanying, gorgeous, salon du thé. Inside, you’ll find a soothingly bright and calm mosaic-filled patio with tents overhead, flowers and chirping birds, which often fly around inside. As you sip your sweetened fresh mint tea—a common drink in North Africa—dig into a triangle of honeyed baklava or a powdered sugar-covered “corne de gazelle.” You’ll forget all about Paris, the noise of the busy streets and any other worries on your mind. Stop into the hammam, or traditional Turkish steamroom and spa, also on the premises, for a day of total relaxation. The famed Ladurée tearoom and patisserie shop was founded as a bakery in 1862, but when a fire engulfed it nine years later, the now-famous pastry shop was born. Tourists have long flocked to this stately teahouse, which has become the epitome of Paris decadence and elegance. Admire the ornate detail of the ceiling moldings as you slice into an expertly crafted and presented patisserie. Top it all off with one of their signature teas and your afternoon break in-style is complete. Located smack in the Haussmann/Opera district in close reach of the city's iconic department stores, this is a great spot to warm up after a day of shopping and sightseeing. Is the World's Tastiest Falafel in Paris?